The Eames Coffee Table is a low and functional mid-century table with a dowel-leg and wire base. Designed by Charles and Ray Eames in 1949 for use in their Case Study House No. 8, the Eames Coffee Table features many of the simple and playful details that the duo explored in similar furniture pieces. The Eames Coffee Table has a height of 15.25” | 38.7 cm and is produced as both a square table with a width of 30” | 76.2 cm, and a rectangular table that is 30” x 45” | 76.2 x 114.3 cm. The tabletop and dowel legs are paired in finishes that range from walnut, to white ash and Carrara marble (with ebonized ash legs). What is the Eames Coffee Table? The Eames Coffee Table is a low and functional mid-century table with a dowel-leg and wire base designed by Charles and Ray Eames (1949). How big is the Eames Coffee Table? The Eames Coffee Table comes in two shapes: a square table with a width of 30” | 76.2 cm, and a rectangular table that is 30” x 45” | 76.2 x 114.3 cm. 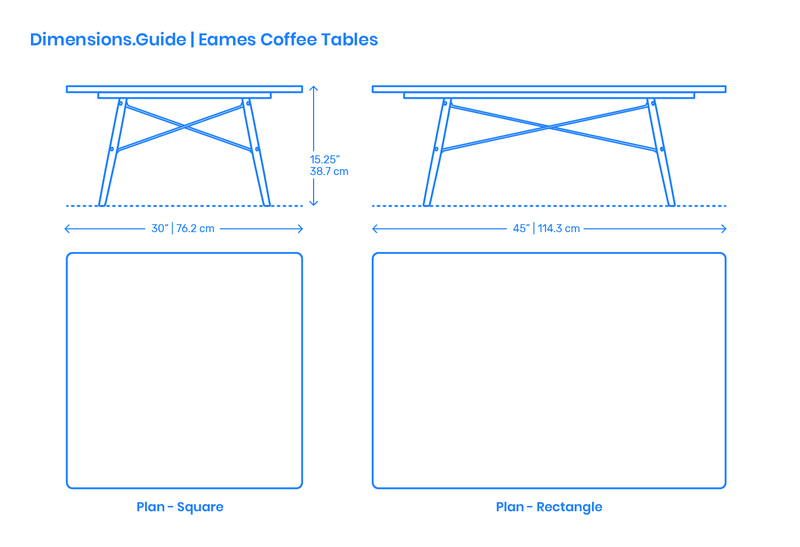 The Eames Coffee Table has an area of either 6.3 ft2 | .6 m2 or 9.4 ft2 | .9 m2. What height of sofa should be paired with the Eames Coffee Table? The Eames Coffee Table has a height of 15.25” | 38.7 cm and should be paired with sofas with seat heights between 15.25”-17.25” | 38.7-43.8 cm.